The world was a different place back when Jack Webb as Sgt. Joe Friday or Ronald Howard as Sherlock Holmes was on the case on the small screen. Relive that era with this 6-DVD collector’s set featuring 50 of your all-time favorite episodes from the best mystery and detective shows ever to air on TV during the 1950’s and ’60s. 25 hours of restored classic TV. 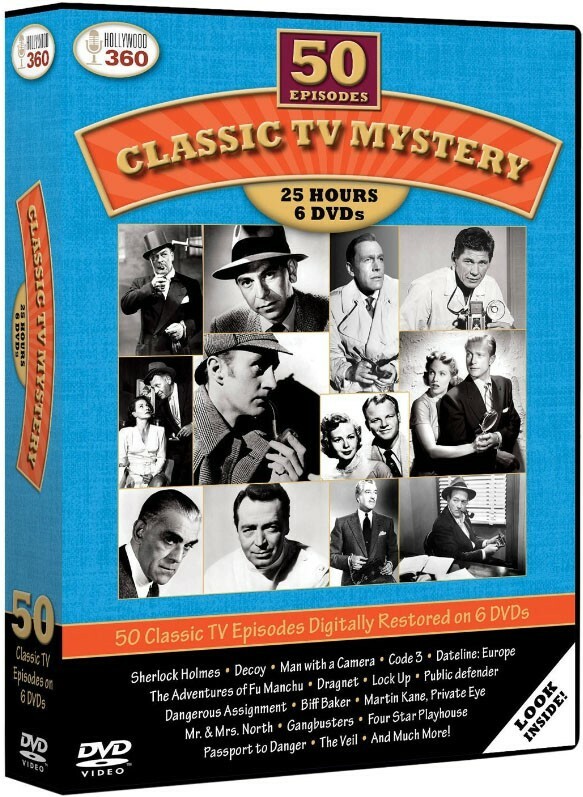 The Adventures of Fu Mancho, Sherlock Holmes, Code 3, Biff Barker, Colonel March of Scotland Yard, Dangerous Assignment, Dateline: Europe, Foreign Intrigue, Decoy, Dragnet, Dr. Hudson’s Secret Journal, Federal Men, Follow That Man, Four Star Playhouse, Gangbusters, Lock Up, Man With a Camera, Martin Kane – Private Eye, Mr. and Mrs. North, Passport to Danger, Public Defender, Racket Squad, Secret File, Terry and the Pirates, The Veil. (There are several episodes of some of the shows listed here for a collection of 50 shows on 6 DVDs).